The situation of receding gums happens when the tissue of the gum around the teeth corrodes and it looks like your gums recede backwards. Then a large surface of the teeth is exposed and more visible. When the gums go back, the space between the gum line and the teeth rises. That is perfect place for bacteria growth. Another problem that may happen is over exposure of the root of the tooth that can lead to extreme pain and sensitivity of the tooth. It will also have a negative influence over the structure and bone of the tooth that can cause losing of the tooth. This is a very common problem and most of the people who suffer from it do not notice the problem. The reason is because the process is slow and happens gradually. Remember to check your gums if you teeth have become very sensitive. That is one of the first signs. Another indicator is the size of you tooth: if it is larger than before then you need to treat the problem because it is a sign of receding gums. Periodontal diseases. That means bacterial infection in the gums. They cause damage to the supporting bone of the tooth and the gums, followed by other problems. Lack of oral hygiene. If you skip teeth brushing and flossing you might build up plague on the teeth. That can lead to calculus which is a hard substance which can lead to gum recession. Aggressive brushing. It is the complete opposite of brushing teeth on regular basis. If you brush your teeth aggressively then the enamel on your teeth will be destroyed and this will lead to receding gums. Sometimes you will blame the genes. In this case you cannot change a lot about your problem. Hormone imbalance can lead to receding gums. This can be a huge problem especially among women. Those changes lead to more vulnerable and sensitive gums. Smoking is also a reason for receding gums. Smoking also causes many other diseases such as lung disease and cancer, but it can also cause receding gums. People, who consume tobacco in any form, can get sticky plague on their teeth more easily and this leads to receding gums. Clenching and grinding your teeth will put pressure on them and this can cause receding gums. Using force to take bits while you eat may also cause the same problem. This is a weird reason, but piercing your tongue or lips can also lead to the same problem. If you notice the problem with receding gums on time your doctor can treat them with either root planning or tooth scaling. The doctor will safely remove the calculus or the plague from your teeth and the surface underneath the gum line. The other case is if you do not notice the problem on time. In this case you may need to do a surgery on your gums in order to repair the damage. Some of the surgeries may be: regeneration of the lost tissue and bone of gums and teeth, depth reduction, soft tissue graft etc. If you like to avoid surgery you can use some of the homemade remedies in this article. But remember to consult your doctor if you have serious gyms infection, because you need to know how deep has the bacteria gone. In this case, this step should not be avoided. If the problem is not so serious then you can use only these homemade remedies. By using them and with proper oral hygiene you can grow back you receding gums. How Can They Grow Back? Gums are soft tissues. They cover our teeth in order to stay in place and they also cover the root of the teeth. 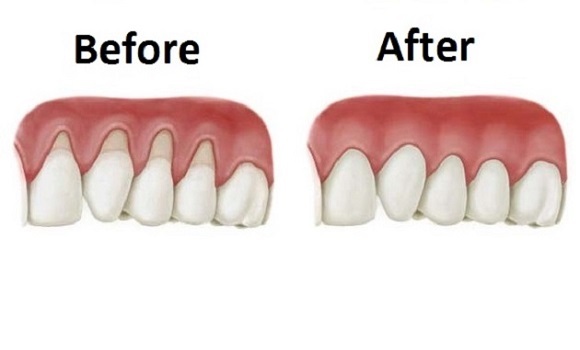 If you want to solve the problem with receding gums you need to have a good oral hygiene and you can use many recipes such as oil pulling in order to grow your receding gums again. Read more in the other sections. We present below homemade recipes that require only simple ingredients such as herbs and spices. Green tea has an abundance of health benefits. It is full of antioxidants that fight the free radicals that can cause periodontal disease which can lead to receding gums. One of the antioxidants in green tea is catechins and it helps in destroying any periodontal disease. This antioxidant can strengthen the connection between the gums and teeth. Its anti-inflammatory properties will lower the swelling of the gums that cause oral diseases. How to use it: Every morning drink 1 cup of green tea. We present you another ingredient that can help you with your gum problem. It is aloe vera and it has many health benefits and most of them are connected with skin problems. The reason is because aloe vera has many anti-inflammatory properties and repairing capabilities. In cases of receding gums, aloe vera will fight against inflammation and will turn on the cells which are very important for repairing of the tissues. It will prevent other infections, due to its antibacterial properties. How to use it: Use the gel from aloe vera for your gums problem. There are 2 ways. The first one is to use aloe vera gel like a mouthwash and for brushing. The other way is to use it as a mouthwash. Once again after you brush your teeth take a little bit of aloe vera gel and dissolve it in some water. The consistency should be good enough for you so you can swirl it through your mouth. Do this every day after brushing. One of the most effective treatments for receding gums is oil pulling. It also helps with other oral diseases and it is mostly known for healing cavities. Sesame oil has many health benefits and anti-inflammatory properties. It can reduce plague buildups and destroy the toxins in your mouth. The sesame oil will form a protective layer over your teeth and it will reduce the chances of plague building. You can also use this method for improving the absorption of healthy nutrients in your body. How to use it: Take sesame oil and warm it up. Do not overheat the oil. You only need to warm it. Then brush your teeth and take sesame oil in your mouth. Gargle it and swirl it around your mouth. Do this for a few minutes. If you are not familiar with this process you can start with 30 seconds to 1 minute and once you get used to the procedure increase the time. The goal is 15 to 20 minutes. You can also use coconut oil for oil pulling. It will reduce the chances of getting infections that may be the reason for receding gums. The coconut oil will heal your cavity and prevent tooth decay and it is one effective ingredient for treating receding gums. How to use it: It is better if you use organic coconut oil. Brush your teeth and then take a little bit of coconut oil and use it as a mouthwash. Once again do the method 1 to 2 minutes and increase gradually. The goal is 15 to 20 minutes daily. It can also help you to grow back receding gums and it will prevent bacteria growth in your mouth. Eucalyptus contains essential oils that have many health benefits. It is known fact that the essential oils from the herbs are stronger than the herb itself. That is very clear since we always use only a few drops of essential oils in many recipes. The essential oil from the eucalyptus can destroy germs and bacteria that live in your mouth. They will protect you from any oral diseases. It has many anti-inflammatory properties and they help in reducing the swelling in the gums. Remember to dilute the essential oil before you put it on your gums. It is really strong. How to use it: Take 1 or 2 drops of eucalyptus essential oil and 1 or 2 tablespoons of water. Dilute the essential oil in the water and dip your toothbrush or your finger in the oil. Apply it on your gums and massage it gently. Wash your mouth with water. This will stimulate the growth of new gums and it will prevent receding gums. You can obtain resin from the Myrrh tree. That resin is used for curing and treating different gums and mouth diseases. It will stop the recession of the gums and it will prevent additional damages to the gums. How to use it: Use powdered myrrh. If you have myrrh in the form of resin, make powder by crushing it. Combine it with water and mix until a paste is formed. Apply it on your gums and massage it well. It should last a few minutes and you can use a toothbrush to complete this method. One of the common uses of clove oil is preventing toothache. Many people are not familiar with the disinfectant properties of the clove. It can help you to destroy the germs and bacteria in your mouth and it will fight against any oral disease. It has anti-inflammatory properties as well and it can reduce the swelling of the gums. In order to fight periodontal disease you have to reduce inflammation. If you try and chew a clove you will experience a numbing effect. After every meal you can chew a clove. Remember that the clove oil should touch every side of your mouth. This will also destroy the bad breath. If you want you can try and use clove oil. How to use it: Take 1 to 2 drops of clove oil and massage your gums. Do this method one to three times in a day. Precaution: in case of using a blood clotting medication, please consult your doctor before you do this method. Lemons are known for their antiseptic and antibacterial properties. The lemon can stimulate the growth of receding gums. It will also destroy the bad breath. Lemons are acidic and remember that too much of them can destroy the enamel on your teeth. Do not use lemon oil every day. It should be used only one time in week. If you want you can make homemade lemon oil and you will not have to worry about that. Directions: put the olive oil in a jar and add the lemon juice. Cover and shake it well. Leave the mixture for a couple of weeks. Remember to shake the jar every day. After three to four weeks you can start and use the oil. How to use it: Apply little bit of lemon oil on your fingers and massage your gums for a couple of minutes. Do this method not more than 2 times in a week. Use a brush with small head and soft bristles. The best way to keep good oral hygiene is to floss and brush after every meal. If you are not able to do that then after every meal use a mouthwash. Mix 1 to 2 drops of essential oil, such as sage oil, peppermint, clove or tea tree oil and mix t with ¼ to ½ cups of water. Mix it well and use it every day. Eat as many fruits and vegetables as you can. We recommend the ones that are full of vitamin C, because it is very important for your gums. It can reduce inflammation and help in the regeneration of the gums. Eat a lot pineapple, strawberries, oranges, cauliflower, asparagus, broccoli, asparagus etc. Reduce the sugar intake and avoid cold drinks. They are perfect home for bacteria. Consult with your doctor for any supplements.